Protests in Algeria, Start of Something Bigger? This is just the latest march by Algerians against the current regime, and protesters say that Bouteflika (bottom-right) needs to stand down and not run in the upcoming 18 April elections. 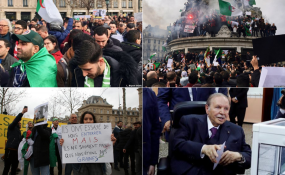 Tens of thousands of Algerians gathered on Friday afternoon for a "March of 20 Million" in the country, calling for ailing President Abdelaziz Bouteflika, 82, who declared his candidacy for a fifth term, to step down. Amid the ululations, old people with their grandchildren, young people, men and women came out to protest, one demonstrator told RFI. "That really gave me hope, because at that moment, I understood that Algerian citizens exist. And at that moment, I started crying. I'm not hiding this, it was a very strong and historic moment," said Amine Benjoudi, 29. His reaction is just one from a popular movement that has brought opposing political parties together in an effort to prevent Bouteflika from extending his 20-year reign in a fifth mandate. The wheelchair-bound president, who suffered a stroke in 2013, is being treated for an undisclosed ailment in a Geneva hospital. "It's truly a popular march, the people are assembling in different areas, they are good-natured and they show they are determined against the fifth mandate and for a change of government," said Said Salhi, vice president of the Algerian Human Rights League (FIDH), earlier in the afternoon. Although a number of protesters said that security forces were out in the capital, the demonstration was a peaceful exercise of their civic rights. A number of lawmakers from the ruling National Liberation Front (FLN) party resigned in protest and joined the protesters, according to local television media. Some stalwart Bouteflika supporters and party members have come out to support the protesters, showing the discontent within his government. As Algerians held flags and flooded into the squares around the capital, women also came out in force, a dual protest on International Women's Day, calling for the draconian Family Law to be abolished. The law allows polygamous marriages to take place, recognizes dowries, and stipulates that entering into marriage for a woman is the responsibility of her father or guardian, among other issues. "Overall none of the candidates, including the candidates of the opposition, is discussing the Family Law. The Family Law today condemns Algerian women to be second-class citizens and treated as minors for life. Demands against the Family Law are paramount," said Thinehinane Makaci, an Algerian feminist who was demonstrating in Algiers. "There are also demands for recognizing women in the workforce, as well as for them to exercise full citizenship. Therefore these demands are on the streets of Algiers today," she added. This is just the latest march by Algerians against the current regime, and protesters say that Bouteflika needs to stand down and not run in the upcoming 18 April elections. "And now, I think that the regime needs to listen to the slogan of protesters: they have to listen to the voice of the people, who say 'no' to a fifth mandate, and 'no' to the regime that has to go," said Habib Brahimi, a protester. Although Bouteflika has promised to bring back restrictions on the number of terms a president can serve, Algerians are going ahead with their protests. "I belong my country, and I want a decent future. That's it. That's what I'm doing. I didn't steal, I didn't kill anyone, none of that," said demonstrator Benjoudi. "Because me, I'm not currently married, but I want my kids to be very, very proud of their Algerian-ness," he added.